President Trump has refused to rule out a pardon of his former campaign chair Paul Manafort. View our resources to learn why a would not fully protect Manafort and could make things worse, not better, for the President. New blog: Robert Mueller Calls Manafort a Liar--Now What? The President’s one-time campaign manager is in jail. Several other people connected to the Trump campaign have pleaded guilty to improper contacts with individuals connected to the Russian government. Dozens of others have been indicted. The President has clearly feared the evidence trail is leading investigators in his direction. The President is trying to shut down Robert Mueller’s investigation into his campaign and stop the other branches of government from serving as a check on executive power. With Sessions gone, the President now turns to Matthew Whitaker to serve as Acting Attorney General, who he no doubt chose because Whitaker would do the President's bidding. He would either move to eventually dismiss Special Counsel Mueller or starve the investigation of money, staff, and authority until it dies. President Trump's firing of Jeff Sessions is intended to shut down the investigation into his campaign. The President is clearly trying to obstruct justice. Here's what you can do in response. 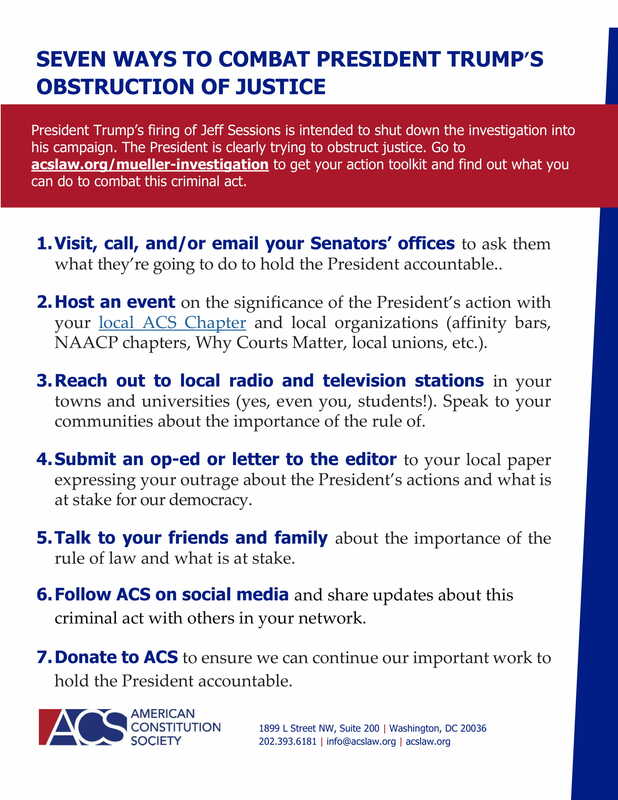 At times like this, the legal profession has a special obligation to speak out against the president’s blatant efforts to undermine the rule of law and ACS calls on attorneys from all sectors to take a stand with us. No one is above the law in this country; not even the president. We need to make our voices heard amidst this constitutional crisis.